A cross section of a pixie chocolate candy captured with an NSI Imagix X-ray Tomography System, showing chocolate (light gray), caramel (white) and pecan (dark gray). 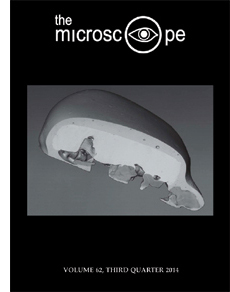 See Inter/Micro 2014 abstract, Three-Dimensional Visualization Using X-ray Tomography, page 105. (Photo courtesy of Robert G. Myers and Philip W. Urnezis, Wm. Wrigley Jr. Company). Excerpt: McCrone Research Institute held the 66th annual Inter/Micro microscopy conference on June 2-6 in its lecture rooms and laboratories in Chicago, drawing attendees from around the world. Participants heard in-depth research presentations by leading microscopists, who covered advancements in instrumentation, techniques and applications in various fields of microscopy and microanalysis. Presentations focused on PLM, SEM, EDS, Raman, hot stage and infrared microspectroscopy; microchemistry; forensic trace evidence and criminalistics; pharmaceutical sciences; materials analysis; environmental health; food analysis; and air quality. Abstract: Microhistology is the term commonly given to the microscopical study of animal feces. A microscopical study of feces is completed to determine the diet of carnivores or herbivores and to observe parasites that have passed the digestive system. Cellular fragments, such as cellular structures (stomata, cells, tracheae, etc.) and epidermal surface attachments (trichomes, scales, glands, etc. 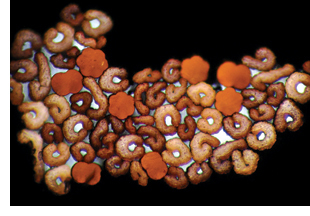 ), are commonly viewed with traditional brightfield microscopy. Crystal and non-crystal inclusions (silica, calcium compounds, starch, etc. ), along with some biological materials (starch, tracheids, etc.) are enhanced with the use of polarized light. However, polarized light microscopy (PLM) is seldom used in biological laboratories. Luckily, simple and inexpensive attachments can be used for basic polarized light to enhance microhistological fragments for better identification. Excerpt: Our lives are at risk. The World Health Organization (WHO) says there is a global security threat that requires action across government sectors and society as a whole. In Atlanta, the Centers for Disease Control and Prevention (CDC) are similarly blunt, describing the situation as a nightmare. In London, Chief Medical Officer Sally Davies, says we now face a catastrophic threat. What is it? International terrorism? No, says Davies, the danger is greater than terrorism. Originally published in The Microscope, Vol. 22, Third Quarter, 1974. Excerpt: Chemical composition of subnanogram particles (< 10 Âµm) can be readily attained by a number or techniques such as electron microprobe X-ray analysis, ion microprobe mass analysis or, less readily, even laser microprobe spectral analysis. The most widely used technique, however, is X-ray analysis as employed in all electron microprobes and most scanning microscopes. Both of these instruments utilize electron excited X-rays for identification of the elements in a small particle. With high-resolution semi-conductor type energy-dispersive spectrometers, a complete semi-quantitative analysis of a one micrometer particle can be carried out within 10 seconds.